Just the other day I received three HyperGel Models Own nail polishes when my sale order arrived and couldn't wait to give them a try so this weeks 'Nails of the Week' post features not one, but two of them as I thought these two colours would look gorgeous together and I wasn't wrong. The colours I'm wearing here are 'Turquoise Gloss' a stunning summery green and 'Blue Glint' an ocean blue both of which are perfect for Spring/Summer. These polishes are super glossy and have been inspired by the current gel nail trend taking over the beauty world; however, what's great about these is you can have the gel effect without the UV lighting or a trip to your local beauty salon. These polishes glided effortlessly onto my nails and were opaque with only one coat but me being me applied two just to add to the opaqueness. As well as being opaque, the formula of these polishes is also quite thick hence the gel look. I've only been wearing this polish for five days but there's still no signs of chipping so I'll definitely be investing in more colours. 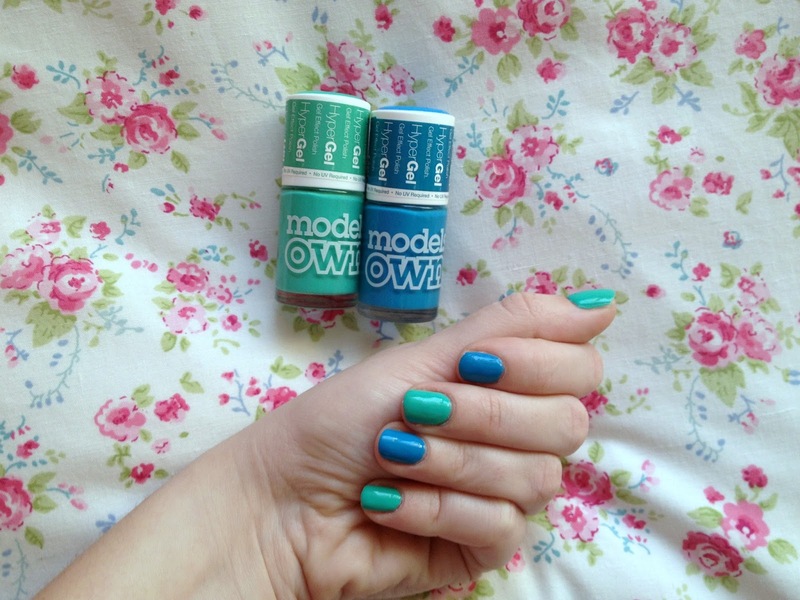 If you'd like to see what other polishes I got in my Models Own sale order then click here. Have you tried the HyperGel polishes, what do you think of them?